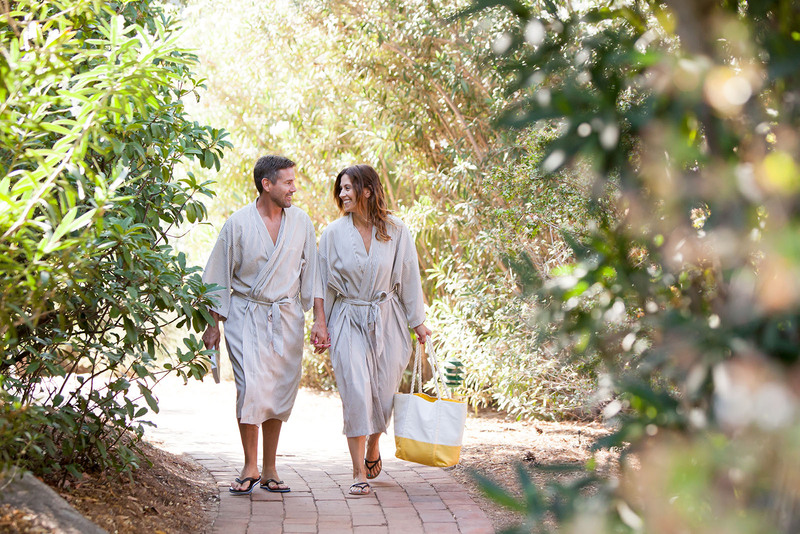 Nurture your mind, body and spirit with Rancho La Puerta’s private healing sessions. From Craniosacral Therapy and Chiropractic services to Feldenkrais®, Acupuncture, Reiki, WATSU®, and Water Dance, our therapists are highly skilled masters—the finest in their fields. Improve and maintain your health through the deeply therapeutic practice of acupuncture. Hair-thin needles are painlessly inserted into a network of energetic pathways called meridians or channels. Energy runs throughout the meridians, allowing for the body’s Qi (pronounced ‘chi’) or energetic life force, to flow without obstruction. Whether you seek treatment for an acute or chronic condition, or seek simply to achieve overall wellness, acupuncture treats the root cause of imbalances. This ancient Chinese healing practice creates a relaxed and harmonious state of equilibrium within. Read more about acupuncturist Regina Aguilera. Ayurveda has been practiced for over 5000 years and is the oldest healing system in the world. Ayurveda means the ‘science of life’ and it teaches us how to live a long, healthy and happy life as well as providing the tools to treat disease. It is based on a profound understanding of nature and the elements that nature encompasses; space, air, fire, water and earth. By understanding nature’s elements within us, we come to understand our own true nature. Through a comprehensive consultation you will be given the knowledge and the tools to empower you to live a balanced life, full of health and happiness. Read more about Ayuerveda Carla Levy. Achieve a revitalized state of health by naturally reducing aches, chronic pain, stress and emotional imbalances. As you rest comfortably, light healing touches are applied to the body to treat trauma and restore health. Biodynamic Craniosacral Therapy brings the emotions and spirit into balance and reconnects the body with its ability to heal itself. Read more about therapist Micheal Brightwood. Lectures about the practice are offered; see schedule for days and times. Understand and treat the root cause of chronic pain with a rehab oriented chiropractic session. Receive evaluations for strength, biomechanics, and gait, and experience corrective soft tissue massage, chiropractic adjustments, and restorative yoga exercises. Guests are provided with a self-treatment plan in order to extend the beneficial effects of these sessions at home. Read more about Ranch Chiropractor Steve Paredes. Dissolve the body’s aches, strains and emotional imbalances with an empowering Reiki session. Soften into tranquility as the chakras are balanced, either with gentle touches or with hands slightly off the body. Reiki uses Qi (pronounced ‘chi’), its life force energy to remove energy blocks so healing energy can freely flow and harmonize the mind, body, and spirit. Experience an optimal state of balance and wellbeing with a Reconnective Healing®. Rest deeply as the practitioner guides energy, light and information (vibrational frequencies) around the body using a hands-off approach. Feel relief as imbalances leave the body, and a sense of harmony replenishes the spirit. Feel alive, relaxed and whole again as tension, pain, and stress diminish. Somatic Experiencing resets the Central Nervous System through sensory methods that help to resolve the effects of past traumas. Learn to regulate stress through a guided exploration of the interplay between emotions and the body. Regain a sense of peace and empowerment as you awaken to the root causes of stressful experiences that manifest as symptoms. 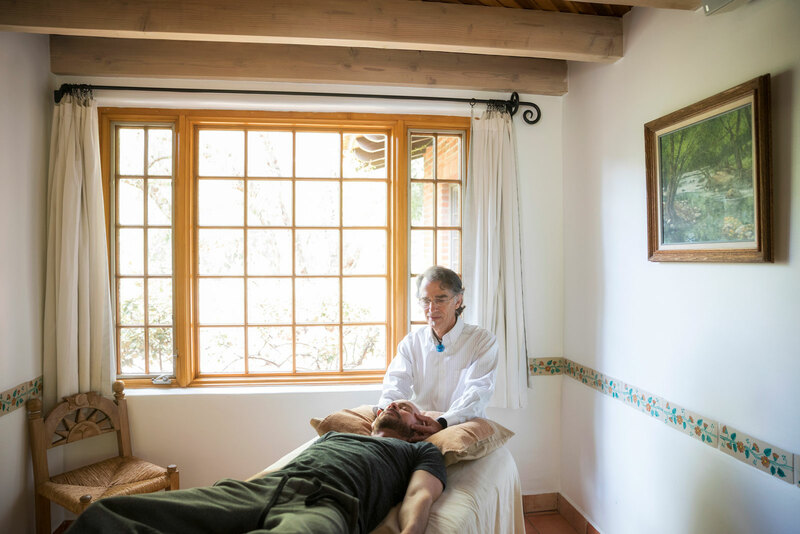 The practitioner will help connect the conscious and subconscious mind with practices such as Chinese Five Element theory, sound, crystal and color therapy, chakra balancing, Neuro-linguistic Programming (NLP), and Applied Kinesiology. Read more about therapist Jonelle Rutkauskas. Lectures on Energy Healing are offered; see schedule for days and times. Improve comfort, posture, and balance while reducing pain, tension, and stress. Each Feldenkrais® Method session is tailored to meet your needs and aimed to improve how you feel and function. As you lay fully clothed on a table, your body will be gently moved in ways that allow for effective communication with the brain and the nervous system. Sessions are designed to increase confidence and pleasure in daily activities. Read more about therapist Donna Wood. Feldenkrais® workshops are offered; see schedule for days and times. Regular massage increases circulation, eases tension, tones muscles, and contributes to total well being. Recommended by Hippocrates as early as 400 bc, massage has long been recognized as an important adjunct to healing. Our signature Classic Massage provides the many substantiated health benefits of massage, and it especially aims at releasing stress and tension in the body and mind. Depending on your preference, the rhythm of your massage can be slow and gentle, vigorous and firm, or deep pressure. Select from our aromatic wellness oils to enhance your treatment experience. 50 and 90 minute sessions. Our therapist’s nurturing touch combined with warmed, smooth river stones renowned for their healing capabilities, effectively release tense muscles, stressed emotions and helps to calm an active mind. Our mountain sage oil is formulated to gently detoxify, calm and ground your energy. 50 and 90 minute sessions. Heat from the stones may cause skin redness lasting up to 24 hours. Not recommended if you are pregnant. A scented massage oil warmed from its candle, is used to gently massage your body with long nourishing strokes from scalp to toes. Unwind, de-stress, and feel warm and revitalized by improved blood circulation. 90 minute session. Please arrive with clean and dry hair. Not recommended if you are pregnant. Choreographed heaven! Two experienced therapists work simultaneously on matching muscle groups on opposite sides of the body, creating a feeling of great balance, symmetry, energy, and release. We offer the most classic form of a four-hand massage, during which therapists mirror each other’s Swedish style massage techniques using a combination of slow and long strokes. 50 minute session. The perfect treatment after a day of activities! This deep massage incorporates a variety of massage techniques with some assisted stretching to release muscle tension, improve flexibility, and range of motion. It also aids in the prevention of injuries. 50 minute session. Not recommended if you are pregnant Fully clothed for 90 min. session. Not necessarily a complete massage. A holistic experience to support your wellness journey, soothe the soul and allow the body to heal physically and emotionally. The power of each wellness focused aromatherapy blend is based on the therapeutic properties of essential oils. Our unique massage technique supports the immune system and promotes balance. Hot compresses applied along the spine help essential oils penetrate into the nervous system. 50 and 90 minute sessions. Not recommended if you are pregnant. Invigorating Detox Massage using special beauty massage cups in combination with 100% natural active ingredients from Mother of Pearl extracts bring out the individual’s beauty to its best. Gentle breathing and profound detoxifying massage techniques revitalize the body and prepare it for the subsequent intense circulation-stimulating massage with the silicone cups. This balanced treatment of a slimming massage and the skin-protecting active ingredients promotes the revitalization and elasticity of the skin. 90 minute session. This focused massage session targets accumulated stress and tension in the back, neck and shoulders; those places where we tend to hold it most. You will feel that weight lifted off your shoulders and relief in the back and neck, resulting in more ease in aligning your posture. 50 minute session. Your casita will transform into your own private spa sanctuary. Our time-honored Ranch Classic Massage is enhanced with your choice of aromatic wellness oils and massage techniques to help relax muscles, calm nerves, and restore balance. Enjoy tranquility and deep rest in the privacy of your own space. 90 minute session. Share this moment in time with a loved one. Side-by-side massages in our couple’s retreat are a perfect bonding time for partners or best friends. Your special connection is nurtured while sharing these sacred healing moments together. 50 and 90 minute sessions. For new or expecting mothers, this massage can include anything from a full body Swedish massage to other light massage modalities. Aimed at alleviating pre or post-natal discomfort, this nurturing massage is comforting and restorative. 50 minute session. As with any therapeutic approach to pregnancy wellness, women should discuss massage with their prenatal care provider. 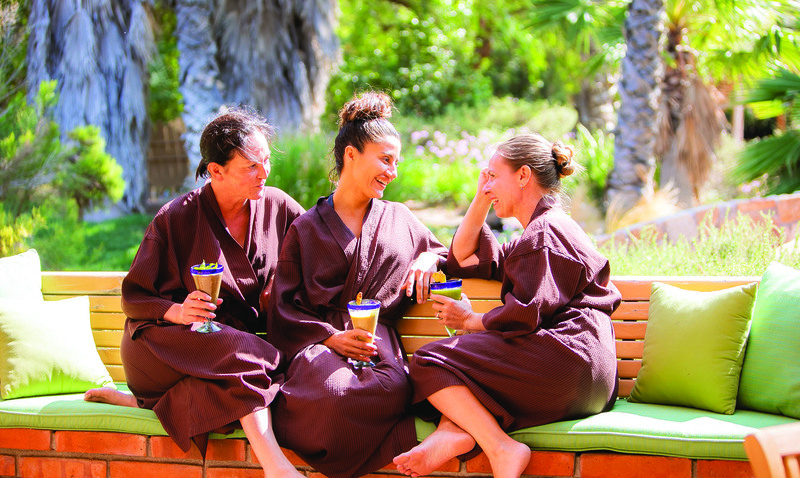 Body treatments, now popular at spas worldwide, have been a fixture at Rancho La Puerta since 1940. Ranch co-founder Professor Edmond Szekely sought a balm for the aches and other muscle discomforts that afflicted some guests who were unaccustomed to dawn-to-dusk exercise. He adapted and modified the 19th-century naturopathic techniques of Father Sebastian Kniepp (1821-1897). Today our treatments are as effective and soothing as ever, promoting circulation and relaxing tense and sore muscles. In ancient Mexico, chocolate (xocolatl) was considered to be food for the Gods. This native-inspired ritual feeds the skin with anti-oxidants from cacao. Nourishing cacao butter and sugar make a delicious body butter scrub that conditions and softens the skin. Exfoliation is followed by a yoghurt and honey mask that renews texture of skin. Massage oil infused with cacao is the ultimate body nourishment. Using techniques such as trigger-point, myofascial and neuromuscular release, your therapist will customize a session that helps address chronic pain and restricted movement. Some temporary discomfort triggered by working on long-locked-up tissues will release into unprecedented new freedom. Note: This treatment is not necessarily a full body massage. Energy healing is a fundamental part of holistic therapy. Your therapist balances chakras and returns them to their natural state of vibration and frequency using color, light, sound, aroma, energy work, and sacred geometry. Crushed rosemary from our garden is blended with organic oil, salt, honey, and oatmeal, for an invigorating massage over the body with a natural loofah to thoroughly cleanse the pores. Dead layers of skin cells disappear and circulation is stimulated leaving the skin renewed, soft and radiant. When the wood element is out of balance it causes an obstruction of energy leading to feelings of frustration, anger, depression, lack of peaceful sleep and irritability. A healthier Wood element gives us the ability to make decisions and plan, and promotes flexibility. What to expect from the treatment: Light or firm strokes stimulate the skin to breathe, expand and repair itself. Avoid sun exposure after any Five Element treatment. When the water element is out of balance, it can result in anxiety, insecurity and lack of confidence. In the physical body this imbalance can result in lethargy, lower back ache and poor concentration. A healthier Water element can give you more focused determination and better knowledge of how to work, rest, and play. What to expect from the treatment: Undulating body movements to create an energetic wave effect throughout the body which facilitates the drainage of toxins. When the metal element is out of balance it impairs the intake and outflow of the most powerful life force, which is air, creating blockages, grief and sadness. In balance, this element generates optimism and orderliness. A healthier Metal element results in a greater sense of self-awareness and life’s meaning. What to expect from the treatment: Firm pressure with pulling and twisting maneuvers restores harmony in the mind and body. When the fire element is out of order one will experience confusion, lack of imagination, brain fog and faulty memory. When in balance life is joyful, peaceful and contented. The heart is the nest of all the emotions; therefore it is responsible for a balanced emotional life. A balanced Fire fuels the passion, desire, and enthusiasm that transforms and drives you in the physical world. What to expect from the treatment: Bodywork on the nerves and muscles along the spinal column to balance emotions. When this element is out of balance one will experience lack of concentration, confusion and excessive mental activity. A more balanced Earth element makes you will feel more grounded, able to eat well (but in moderation), and facilitates a relaxed and calm mind. What to expect from the treatment: Cross-body movements and Shiatsu that stimulate the communication between the two cerebral hemispheres. Facials prepare the skin to absorb beneficial therapies such as anti-aging serums, and protect the skin against infection via improved cell health. Fine lines diminish as the skin’s outer layers exfoliate, revealing smoother skin underneath. Our Amala facials are the perfect introduction to what we hope will become a life-long practice! A beautiful integration of herbal and aromatherapy that help to enhance the vitality and radiance of the skin. This facial includes cleansing, herbal exfoliation, customized mask, and a facial massage with rare and precious essential oils that nourish tissue and restore proper cellular metabolism. The treatment finishes with an organic herbal face serum and a calendula moisture cream to heal and sooth, leaving the skin hydrated, nourished, and rejuvenated. Recommended for: All skin types (extractions if needed). Restores youthful elasticity and leaves your skin feeling hydrated, fresh and radiant. This facial starts with a deep cleansing and purification of the skin, followed by polishing and a mask that smooth fine lines, rejuvenates, and rehydrates—a “harmony” of results! Recommended for: Mature skin (extractions if needed). Enjoy a superb well-being experience that leaves your skin shimmering with luminosity and suppleness. Smoothing, anti-aging and long-lasting moisturizing effects result from a warm stone facial massage featuring organics that literally makes wrinkles and expression lines fade away...along with all your cares and stress. Recommended for: Mature / dry / sensitive / dehydrated skin (no extractions). In the religious culture of Eastern Asia, Blue Lotus symbolizes purity of mind and body. These, and other healing plants and flowers of Eastern Asia, inspired this balancing, clarifying and restorative treatment. This deep cleansing facial provides essential nutrition, replenish amino acids and purify the skin as it restores balance for a healthy complexion. Recommended for mature, dry and dehydrated skin. Extractions provided if needed. Dramatically restores skin tone, smoothness, and minimizes fine lines and wrinkles. We begin with a thorough cleansing, and then imbue your skin with a renewed look achieved via lifting and stimulating the underlying facial tissue using massage techniques. Other benefits include increased circulation, improved neuromuscular response and tissue vitality. This results-oriented treatment is performed with our exclusive organic skincare products. Recommended for: Mature Skin. 80 min. session includes extended facial massage and extractions. Perfect for a man’s skin, this facial provides the full spectrum of skin benefits using our organic skincare line to refresh and revitalize. Depending on your needs, your aesthetician will determine the appropriate combination of treatments for your skin: cleansing, double hydrating, mask, and some extraction may be included. The facial concludes with a relaxing scalp and neck massage. Recommended for: All skin types (extractions if needed). Please shave at least three hours before the facial. Often overlooked, the back deserves better! Our back “facial” begins with a deep steaming designed to open the pores and soften the skin, followed by an exfoliating scrub to remove dead skin cells and extractions on clogged pores if needed. Then your back is covered in a rich organic moisturizing mask to restore balance, clarity and radiance of the skin. Recommended for: Problem skin (extractions if needed). Our herbal wraps are inspired by Father Sebastian Kneipp’s water bath. Father Kneipp was a Bavarian priest and one of the founders of the naturopathic medicine movement in the 1800’s. 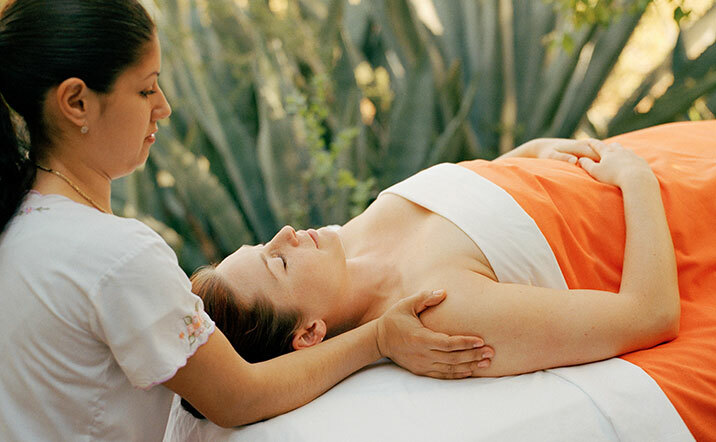 The Ranch uses aromatic herbs from the gardens of Rancho La Puerta to help deeply relax the muscles. Herbal wraps are wonderful for arthritis, bursitis, pulled muscles, rotator cuff issues, and other physical ailments. It decreases inflammation and helps purify skin It’s hard to stay awake during this very relaxing wrap! To ensure your maximum comfort, we always ask if you want your arms wrapped in or out. The RLP Herbal Wrap has been a long standing tradition in the Ranch Healing Process. Steaming hot linens steeped in local Native American herbs wrap the body to warm, cleanse and detoxify. This famous wrap is recommended prior to any massage to prepare the body for deep relaxation and to release muscle tension. This purifying, cleansing treatment uses seaweed as the principal element. It improves circulation, detoxifies, and helps remineralize the skin cells, improving tone and cellular metabolism. You’ll derive total relaxation from our combination of foot reflexology and hand massage. Communication with the whole body through the hands and feet releases energy blockages in the meridians and trigger points. A warm finishing dip of essential oils leaves your hands and feet satiny smooth and soft. 50 minute session. Our therapist applies targeted pressure to points on the feet with the help of energy balancing gem stones. This treatment releases energy blockages and stimulates circulation, which relieves stress and increases well-being in the entire body. The Runner’s Reflexology treatment soothes and revives runners’ feet and legs. Our therapist applies targeted pressure to points on the feet with the help of energy balancing gem stones. This treatment releases energy blockages and stimulates circulation, which relieves stress and increases well-being in the entire body. Guests traveling from afar will love our Jetlag Reflexology Treatment. This energizing experience begins with a hydrating mini-facial followed by foot reflexology and a hand massage. A warm finishing dip of essential oils leave hands and feet satiny smooth and soft. This treatment will reduce any water retention caused by travel, and restore your body’s natural equilibrium, so you can fully enjoy your time at The Ranch. 50 minute session. This nourishing treatment relieves dry scalp and helps damaged hair recover its suppleness. Vigorous brushing supplies oxygen and nutrients to the hair follicles. A neck and shoulder massage follows to relax tense muscles. 50 minute session. Please arrive with clean and dry hair. Leave oils in your hair for at least two hours after the treatment and avoid sun exposure while the oils are in your hair. The salon, a bright and airy space enlivened with folk art, is a great place to relax, alone or with friends. This is a dream come true for your feet. Our pedicure includes a spiritual walk on our outdoor reflexology path (optional), followed by a foot wash ritual, a complete pedicure, relaxation reflexology, and a foot massage that slips you into a blissful state. This customized manicure beautifies your hands while fragrant essential oils indulge your senses. Nails are trimmed and shaped. Cuticles are pushed back and oiled. A wonderfully gentle exfoliation scrub prepares your hands to be massaged and moisturized with warm oils. Your treatment is completed with a soothing hand and arm massage, and buffing—the final touch to beautiful hands. This simply wonderful customized pedicure begins with a relaxing soak in scented water followed by cuticle nail work and callous reduction. Next, a gentle exfoliation scrub prepares your feet to be massaged and moisturized with warm oils. This indulgence concludes with a treat—a massage to legs and feet. Polish is professionally applied in the color of your choice. Recharge your polish. 15 minutes. Add to your Manicure or Pedicure service. What could be better for a spa connoisseur? Great savings and therapeutic relaxation create the perfect synergy in our Spa Packages. When requesting spa appointment times before arrival, keep these package options in mind. Know what treatments you want and when you want it. Enjoy any 8 SPA treatments* and receive 16% discount! *Four Hand Massage, Cooking Classes, and Therapeutic Private Sessions (Watsu, Craniosacral, Chiropractic Service, Feldenkrais, and Acupuncture) are not included in any spa package pricing. Spa services are limited to availability; guest will be guaranteed the number of treatments in their package, but not necessarily the specific treatments of their choosing. Spa package is per person, for up to seven continuous days. Some restrictions apply. Prices can change without notice. Mexican tax will be added. Cannot be combined with any other promo. The Natural Healing Process will cleanse, relax, restore and energize you during your stay. We take the guess work out of planning your spa experience so you can heal within. All juices are hand pressed at Terra Allegra Juice Bar. Individual treatment times vary. No day or treatment exchange. Cannot be combined with any other promo. Subject to availability. Mexican tax is not included in this price. 90-minute Xocolatl Skin Replenishment Treatment. Xocolatl Skin Replenishment Treatment is 90 mins. Other times vary for Bean to Bar and Vino and Chocolate Pairing. Sign up early as space is limited.